Find and shop our huge selection of washers from all of the leading brands. Our washing machines include state of the art features, efficient performance and beautiful styling. 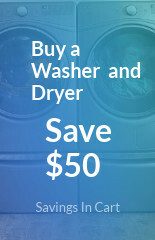 Save money on your next washer purchase at US Appliance.